Palestine 1918: Ex-soldiers Leo, Holly and Job are pondering their future now that the Great War is over. Then Leo is accosted in an alleyway and knocked unconscious. He awakes in a strange house, where he meets Ayesha, a beautiful, mysterious young woman who promises him power, riches and glory if he can survive a perilous journey to join her again in her own land. Giving him a map and a golden ring, Ayesha then sends Leo away. He manages to find his way back to Holly, who recognises the insignia on the ring as that of Kallikrites, an ancient High Priest of the legendary lost city of Kuma, supposedly somewhere deep in the desert in the Mountains of the Moon. Leo, Holly and their batman, Job; set off into the desert in search of the city and discover an adventure beyond their wildest dreams – a dangerous and mystical adventure of cruel love and burning jealousy, of romance and tragedy, and of death and immortality – an adventure which has already spanned more than 2,000 years! 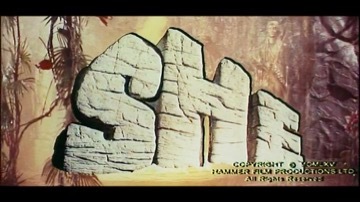 This was Hammer’s longest film and their most ambitious production to date, an epic adventure in the style much preferred by Michael Carreras to the Company’s usual subject matter. It also marks the first billing of later producer Aida Young. Although she had made her mark in the first James Bond film, “Dr No” (1962), it was this film that rocketed Ursula Andress to international stardom. John Richardson had already appeared in Mario Bava’s “Black Sunday” (1961), an Italian horror film starring Barbara Steele. His other roles for Hammer were in “One Million Years B.C.” (1966) and “The Vengeance of She” (1968). Robert Day was a highly versatile director. His widely contrasting films include “The Green Man” (1956), “First Man into Space” (1958), “Grip of the Strangler” (1958, with Boris Karloff), “Corridors of Blood” (1958, with Karloff again and Christopher Lee), “Two-Way Stretch” (1960) and five “Tarzan” movies – “Tarzan the Magnificent” (1960), “Tarzan’s Three Challenges” (1963), “Tarzan and the Valley of Gold” (1966), “Tarzan and the Great River” (1967) and “Tarzan and the Jungle Boy” (1968).